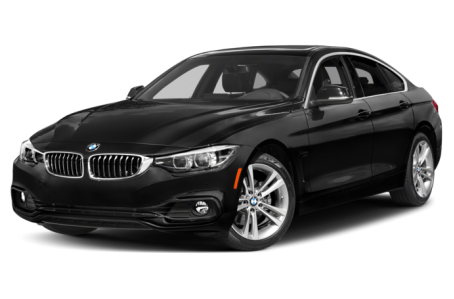 The 2018 BMW 430 Gran Coupe is the liftback version of the regular 4 Series. Both the 430 and 440 Gran Coupe have two trims are available: the base sDrive model and xDrive. The 430 and 440 Gran Coupes have the look of a sedan with the convenience of a hatchback. They maintain an aggressive, sporty appearance like other compact BMWs in the lineup. LEDs for the headlights, fog lights, daytime running lamps, and taillights come standard. Other standard features include power/heated side mirrors with turn signal indicators, a power moonroof, a power liftgate, and 18-inch alloy wheels. An aero kit, sport-tuned M suspension, and sport brakes are also available. The 430 Gran Coupe is powered by the 248-hp, turbocharged 2.0-liter 4-cylinder engine, while a more powerful 320-hp, twin-turbocharged 6-cylinder is contained for the 440 Gran Coupe. Both engines are mated to a standard 8-speed sport automatic transmission and rear-wheel drive. All-wheel drive (xDrive) is also optional. Inside, the 430 and 440 Gran Coupe have a premium leatherette interior with a 40/20/40-split folding rear seat. Maximum cargo space is 45.9 cubic feet with the rear seat folded down. The center console features an upscale audio system, which includes CD/MP3 playback, Bluetooth connectivity, and a USB port. It can be upgrades with navigation, Apple CarPlay compatibility, a Wi-Fi hotspot, wireless charging station, a Harmon Kardon premium audio system, and smartphone access to remote services for emergencies, traffic updates, vehicle location, and vehicle lock/unlock. Standard features include automatic climate control, automatic dimming rearview mirror, and push-button start. Non-sport seats, heated front and rear seats, a heated steering wheel, and remote proximity keyless entry are available as well. A backup camera comes standard. Front and rear park assist, a blindspot monitoring system, pre-collision warning, pedestrian detection, a collision mitigation system, lane departure warning, and adaptive cruise control are available as well.